Who Am I? What's Race Got to Do With It? Gary Younge, black British writer for the Guardian who covers the United States, points out that we all have identities we aren't always aware of and that other people define what they are. Touré, the cultural critic, asks, "Who's Afraid of Post-Blackness?" CNN correspondent Soledad O'Brien and CNN executive Mark Whitaker bring their biracial backgrounds to the discussion. Herb Frazier tells stories about the Gullah people of South Carolina, who have held on to their African heritage. Don Lemon, the CNN anchor who recently came out as gay, writes of a lifelong effort to escape "the black box." Medical writer Harriet A. Washington asks who owns the most essential part of one's identity - internal body parts. Herb Boyd, New York-based author, journalist and activist, and Todd Burroughs, Maryland-based journalist and black-press historian, have written "Civil Rights Yesterday and Today" (West Side, $19.95). Did the election of Barack Obama mark a turning point in American race relations? In discussing their 192-page coffee-table book, Burroughs, who teaches at Morgan State University, writes that, ". . . if anything, the ascension of President Obama as this country's leader threw into heightened relief the deep racial divisions remaining. ". . . 'Civil Rights: Yesterday and Today' offers the case that, while the police dogs and fire hoses may be gone, racial injustice is still alive and well in the land of the free. ". . . Conversely, there is cause for hope. Today, African-Americans make up the highest number of entrepreneurs in this country. 'Cold case' high profile crimes against Blacks, such as the murder of civil rights leader Medgar Evers, have been successfully re-opened in recent years, with convictions won. And the rate of African-Americans obtaining college diplomas has steadily increased since the 1950s (though still remaining below that of whites)." Boyd, author of more than 20 books, is quoted saying, "So often with books about the Civil Rights Movement, you get so little about what happened before and after. So 'Civil Rights: Yesterday and Today' is an attempt to tie it all together." Upcoming: Boyd, Ron Daniels, Maulana Karenga, and Haki Madhubuti have edited "By Any Means Necessary - Malcolm X: Real, Not Reinvented Critical Conversations of Manning Marable's Biography of Malcolm X," due in November from Third World Press. Herb Frazier, a veteran journalist who is now public relations and marketing manager for Magnolia Plantation and Gardens near Charleston, S.C., has written " 'Behind God's Back': Gullah Memories" (Evening Post Books, $22.95, paper). The Gullah people, who live in the coastal area of the southeastern United States, have preserved more of their African cultural heritage than any other black community in the country, according to the publicity material. ". . . 'Behind God's Back' is a compilation of accounts of the experiences of Gullah people who struggled after Emancipation, through the Depression and into the middle of the twentieth century to maintain their African-based lifestyles in rural communities near Charleston." Frazier has reported for five daily newspapers in the South, including his hometown Post and Courier in Charleston. The Coastal Community Foundation of South Carolina, a Charleston-area philanthropic group concerned that residential and commercial growth would alter the area's rural character, contracted with Frazier to write an area history. Filled with the names of residents black and white, the stories appear to be designed primarily for local consumption, but Frazier told Journal-isms there are reasons why a national audience should be interested. "A lot of the people who lived here moved up north to Philly, D.C., Baltimore and NYC," he said by email. "I think that people who are interested in Gullah culture around the country would be interested in how these communities survived." He writes that his maternal great-grandparents and his maternal grandmother were reared in the area, and adds, "Now that the book is finished, I will look for my family's Berkeley County story." Don Lemon, CNN anchor, has authored "Transparent" (Farrah Gray, $24.95). Lemon launched this independently published book in May with revelations that he is gay and had been sexually abused as a child. Asked then whether he had a message for other journalists or specifically for journalists of color, he replied, "I'd like other journalists to know they can be free to be who they are: gay, straight, black, white, woman or man. "We are all 'people' who just happen to have journalist as a title. Journalists of color are well aware of the sometimes rocky path towards equality. So, I suspect they relate to their gay colleagues in a BIG way. If not, they should." This highly readable book, however, is about more than Lemon's declaration of his sexual orientation or of child abuse. A recurring theme is escaping what he calls "the black box," and his stories also say much about negotiating a career in television. Lemon, a native of Baton Rogue, La., says he left Louisiana State University in an attempt to escape the racial "black box." In a statement Lemon took as racist, a white professor told him, "I don't know why you're here. You'll never make it in this business." With $200 in his pocket, Lemon left for New York, finding work in New York, Birmingham, Ala.; St. Louis; the NBC owned-and-operated station in Philadelphia; and ultimately at CNN. Along the way, Lemon is given reasons why NBC News wouldn't do a story about AIDS in the black community ("they didn't think it would appeal to an audience more interested in stories about hormone replacement therapy, low testosterone for men or senior citizens who gamble too much") or use black experts to comment on the late, then-ailing singer Luther Vandross ("We don't want to make this a black story, do we?"). Our protagonist goes to Africa to cover the AIDS story on his own dime, and viewers love the pieces that result. Later come Hurricane Katrina and the death of Michael Jackson, both informed by Lemon's own background as Louisianan and as fan. For news consumers, there is this advice: "The next time you watch the evening news, pay close attention to the commercials. They'll tell you exactly who the program is aimed at. The stories in the broadcast, other than the breaking news of the day, will be aimed at exactly the same people as the commercials." Would-be journalists are given interviewing tips. As for the "black box," by the end, Lemon concludes that "my life experiences have taught me there's a bigot in every neighborhood. Sometimes you fight them with your fists, but mostly you fight them with your grace, your intelligence and your wit. You fight them by acknowledging them to be the scared little children they are." Soledad O'Brien, CNN anchor and special correspondent, has written "The Next Big Story: My Journey Through the Land of Possibilities" (Celebra,$24.95, hardcover; $15, paper; audiobook, $18.99 and $20.95), with Rose Marie Arce, a CNN senior producer. O'Brien called attention to this book, newly available in paperback, last year when CNN posted an excerpt describing O'Brien's anger and embarrassment when Jesse Jackson raged to her that CNN had no black anchors, not realizing that the light-skinned, multiracial O'Brien was black. In 2010, O'Brien, by then known for her "Black in America" and "Latino in America" series on CNN, would be named Journalist of the Year by the National Association of Black Journalists. "The CNN reporter Soledad O'Brien is the daughter of a white Australian father and a black Cuban mother. This heritage bequeathed her an immigrant's ideals about America's promise, as well as a striking appearance that has shaped her experience of 'the land of possibilities.' Both these themes - her roots and her looks - run through O'Brien's memoir, 'The Next Big Story,' as she charts her lifelong effort to forge a singular identity out of her biracial background. Her account, written with Rose Marie Arce, is also a reporter's reflection on the television news business, which in the span of her 22-year career has swung from largely ignoring issues of race to often stoking prejudice with bombastic, personality-driven coverage." Arce told Journal-isms that the pair had produced "a great read on one journalist's life experiences with race and how they formed her approach to reporting and commitment to giving voice to disenfranchised 'communities. I'm very proud of our book." 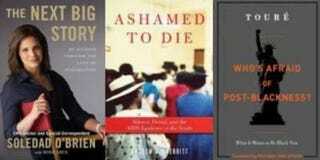 Andrew J. Skerritt, a veteran journalist who teaches journalism at Florida A&M University, has written "Ashamed to Die: Silence, Denial, and the AIDS Epidemic in the South" (Lawrence Hill Books, $24.95), to be published in November. As a reporter for the Rock Hill (S.C.) Herald in 2000, Skerritt wrote "AIDS in a Small Town," published in time for that year's World AIDS Day. "The story told of how AIDS stalked the streets, especially in the predominantly black sections of Clover (S.C.), and of the silence and denial that made a lethal illness even more deadly," Skerritt writes. A focal point was the Rev. Patricia Ann Starr, who worked with people living with AIDS in the small textile town 40 minutes south of Charlotte, N.C.
Skerritt says in the book's prologue, "In June 2003, I left South Carolina for Florida to work as an editor for the St. Petersburg Times. Journalists are nomads with short memories. We rarely look back. Each new job usually means new stories, new sources. But the story of AIDS in Clover refused to let me go. After two years of procrastination I called Reverend Starr. "Can I tell your story? I asked. "The initial encounter between reporter and speaker evolved into an education about HIV/AIDS in one of America's most vulnerable places. After countless telephone conversations, funerals, hospital and home visits, tears, and laughter, I came to understand and respect the fervor of those for whom fighting AIDS has become a crusade. . . .
"This work is an attempt to break the silence, to provide a living memorial to the men and women in the shadows, those claimed by AIDS, those unfortunate enough to live in Clover, South Carolina, instead of more headline-grabbing places like Soweto, South Africa." The dust jacket adds, "Skerritt contends that taboos about love, race, and sexuality - combined with Southern conservatism, white privilege, and black oppression - continue to create an unacceptable death toll and that, despite AIDS awareness programs and medical breakthroughs, the epidemic is not lessening in the Deep South." Touré, magazine writer, author, television host and MSNBC correspondent, has written "Who's Afraid of Post-Blackness? : What It Means to Be Black Now" (Free Press, $25; Kindle edition $11.99, audiobook, $29.39). The 40-year-old cultural critic who uses one name (he's named after the late Sekou Touré, president of Guinea) dedicates this book "to everyone who was ever made to feel 'not Black enough.' Whatever that means." He makes an argument that there is no single way to be black. Michael Eric Dyson, the professor, author and talk-show host, provides an essay-length foreword backing up Touré's premise, and Touré adds the thoughts of some of the 105 accomplished African Americans he interviewed. They include Jesse Jackson, Dr. Alvin Poussaint, Malcolm Gladwell, Chuck D and Cornel West. While Touré's premise seems basic enough, Harvard law professor Randall Kennedy, writing for theRoot.com, countered that the argument is a little too elastic. Black people do have the right to expect others not to be Uncle Toms, Kennedy said, finding the author's premise self-serving. "Despite his avant-garde pretensions, Touré is at bottom rather conventional: a politically liberal black guy who wants to make it in the white-dominated world of print journalism and television broadcasting without catching flak from 'brothas' and 'sistahs' because of the way he talks (preppy), because of his significant other (a woman who is not African American) and because of his attachment to ideas that he knows some blacks will disdain," Kennedy wrote. Journalists can relate to Touré's example of trying to make it in the magazine business. One editor told him, "I know you can write about Run-D.M.C. But can you write about Eric Clapton?" "It wasn't a question, it was rhetorical," the author writes. " . . . I still to this day don't understand why someone would think I'd be unable to research and understand Clapton and spend a day talking an hanging with him, just like any white writer. Clapton in particular was a horrible example because he comes from Black music. He's a direct [descendant] of the blues and a devotee of Jimi Hendrix. It'd be valuable to have a Black writer talk to him." Or, succeeding as a student in Columbia University's graduate MFA school for creative writing. Touré took an "incredible" class taught by department head Richard Locke that examined "why writers place each word where they do . . . but there was not one Black writer on his syllabus." His few black classmates decided to stand on their last day and say they did not understand the exclusion of black writers, "that it made us feel as though our aesthetic was unimportant, and that we hoped that in the future the syllabus would grow broader." But the others abandoned Touré when he was called upon. Touré made his point, but it was a white student who spoke up to agree with him. Chicago columnist Esther Cepeda, writing for the Washington Post Writers Group, wrote, Touré's "view that to 'experience the full possibilities of blackness, you must break free of the strictures sometimes placed on blackness from outside the African-American culture and also from within it' is relevant to Latinos, Asians and Muslims struggling to define the diversity of their ranks." An October book-tour appearance at the Howard University bookstore demonstrated how far readers can stretch the argument. One audience member rose to assert that "I'm not black. I don't need a race." Harriet A. Washington, who specializes in medical writing, has produced "Deadly Monopolies: The Shocking Corporate Takeover of Life Itself - And the Consequences for Your Health and Our Medical Future" (Doubleday, $28.95). Washington won plaudits for her 2006 work, "Medical Apartheid: The Dark History of Medical Experimentation on Black Americans From Colonial Times to the Present." Journal-isms asked Washington, a onetime newspaper journalist whose career has taken her into training as a medical research scholar and medical ethicist, whether she still considered herself a journalist. "I'm not convinced that I have to choose between the labels," Washington replied. "Like Carl Elliott, Jon Kaplan and slew of other newspaper-column ethicists, I do both . . . and write about medicine almost exclusively. What's most pertinent for this book is my 'medical ethicist' training (Harvard Medical School, 2002 - 2005)," she said by email. The book, which includes 345 pages of text and 88 of notes, bibliography and index, asserts that "human life is rapidly becoming a wholly owned subsidiary of the medical-industrial complex." What should journalists, particularly journalists of color, take away from this volume? "Excellent question!" Washington replied. "There are many many profit-driven contemporary research issues that disproportionately affect people of color in this book, and some that affect us exclusively, but very few have received attention — or accurate attention — in the mainstream press or in the medical ethics literature. "I discuss the disproportionate appropriation of tissues and organs from people of color, the specious design of 'black drugs' such as BiDil, the only drug to be FDA-approved for blacks only; the dramatic overrepresentation of blacks in ethically abusive research schemes such as the testing of experimental measles vaccines in black children and the involuntary testing of [Polyheme], a patented blood substitute; the use of the developing world as a testing site for Western pharmaceutical corporations who price the resulting medications out of reach of the poor people of sub-Saharan Africa, Asia and Eastern Europe, and more. "Because these issues rarely form part of the medical-ethics canon, it is absolutely imperative that more African Americans, especially journalists, turn their attention to medical ethics issues and learn enough to decide for themselves what the issues are. In my view these issues are often defined in the news media by people who do not necessarily have the perspective of people of color or who are conversant with our medical issues and history, and so many medical-ethics accounts of African American issues similarly miss the point or at least lack nuance. We need many more African Americans (and Hispanics) in medical ethics." Schuster, $25.99). A top executive at CNN who held similar positions at NBC and Newsweek, Whitaker launched his memoir in October with parties in New York and Washington attended by the bold-face names that populate media gossip columns. Reviewers have described it as beautifully written, well-reported and, in the words of Booklist, a tale of "family relations and racial identity." "My book is about family, not a typical reporter's memoir full of professional war stories," Whitaker told Journal-isms by email. "But there are a few behind-the-scenes accounts of how Newsweek and NBC covered 9/11 and the Monica Lewinsky scandal and the 2008 elections, and journalists of color may be interested in what I thought — and my father thought — about the attention I got as the first African-American editor of a national newsmagazine. "I also applied my professional training to the reporting and writing of the book, and that's something that journalists of any color can do in reconstructing their own family stories." On CNN.com, Whitaker elaborated on that advice. He also described his parents: "They both came from fascinating backgrounds: He was the son of black undertakers from Pittsburgh, who had grown up in a world that was a cross between an August Wilson play and 'Six Feet Under.' She had come to America from France as a teenage refugee with five of her seven sisters while their father, a Huguenot pastor, stayed behind to organize the small mountain village where he preached to hide thousands of Jews from the Nazis. "But as intriguing as those facts were, I knew that my family story didn't end there. It also included what happened after my parents divorced seven years later: My mother struggled with depression and financial hardship as she was forced to support my younger brother and me on her own. My father plummeted into an alcoholic spiral that destroyed his promising career as an Africa scholar. I battled loneliness and obesity and teenage fury as I coped with feelings of abandonment. I knew I couldn't revisit the romantic aspects of the story without also reliving the tragic parts, and for most of my adult life I had no desire to do that." Since all the descriptions of the elder Whitaker in the promotional material seemed unflattering, to say the least, Journal-isms asked Whitaker, "While the truth is the truth, some might view this as one more book portraying black men in a negative light. Would they be wrong to think of it that way?" The author replied by email, "Although some reviews have focused on my father's failings, if you read the book you'll see that it provides a much more complex portrait of him. He was an alcoholic and a womanizer and a deadbeat dad, but he was also a brilliant scholar and a charming companion and a wise soul who gave me a lot of useful advice through the years. 'My Long Trip Home' is not just a description of the many long trips I took to new homes as a child but my fifty-year journey toward understanding and forgiving my father and recognizing the positive influence he had in my life." Whitaker enclosed links to reviews by two black men, Joseph Williams of Politico and Ralph Eubanks, director of publishing at the Library of Congress. "Caught off guard, Walzer answered rather clumsily, 'I guess I would say that that's too bad, and that in the future I hope we don't have too many more people like you.' Rather than take offense, Whitaker replied, 'Look, I think I understand what you're saying. But I guess I would say that it's not a matter of choice: The world is going to have a lot more people like me.' "
Juan Williams, political analyst for Fox News Channel, has written "Muzzled: The Assault on Honest Debate" (Crown, $24, audio book, read by the author: $23.95). By now, everyone knows the events that prompted this book: NPR clumsily fired Williams from his news analyst job a year ago after he told Bill O'Reilly on Fox News' "The O'Reilly Factor" that Muslims dressed in Muslim garb on planes made him nervous. Williams also reminded O'Reilly that all Muslims should not be branded as extremists. Williams went on a tear against NPR, denouncing the network in as many venues as possible, and Fox News rewarded him with a three-year contract worth nearly $2 million. Media writer James Rainey would write in the Los Angeles Times, "We should all be so muzzled." Alicia Shepard, NPR ombudsman at the time the events took place, wrote, "Williams' book is a reminder that the great thing about writing a book from the author's perspective is it is just that - the author's perspective, or the author's interpretation of the facts. In this case, Williams writes about the facts surrounding his firing. He takes no responsibility in the book for his role in the early end to his contract with NPR, after a decade with the network. There are always two or more sides, but in this book he dismisses NPR's." She added, "(Read the book's first and last chapter for his account. The rest of the book is a polemic about the need for tolerance in political debate, which any rational person would agree with.)" "Juan Williams, again, works for Fox News. The closest Fox News gets to a regular minority presence is brunettes. (And Geraldo, I guess.) It's the channel of aggrieved white people who think they don't count as 'elites' because they don't … listen to NPR." Gary Younge, a columnist who covers the United States for Britain's Guardian newspaper and also writes for the Nation magazine, has written "Who Are We — And Should It Matter in the Twenty-First Century?" (Nation Books, $26.99). Everyone has several identities, Younge writes, whether we are aware of them or not. Others choose most of them, not us. As a black Briton whose parents are from Barbados and who has spent time in Sudan, Scotland, Russia, Puerto Rico and on the U.S. mainland, Younge has a vantage point few can duplicate. We might have heard horror stories about some Russians' hostility toward black Africans, for example, but who would have thought that in Younge's case, "my black skin, plaited hair, Levi's jeans and Converse trainers . . . . made me the quintessential symbol of wealth and Western cool — in the eyes of Russians, at least"? A chapter on the fierce reaction by some in Congress to the 2009 nomination of Sonia Sotomayor to the Supreme Court skewers those who denounce "political correctness" without acknowledging — even to themselves — the inherent advantages of white men. The Sotomayor case isn't the only example. Included are the controversies over affirmative action at the University of Michigan and the charges of "reverse racism" after Frank Ricci, a white man, was not selected for the New Haven, Conn., fire department. "The refusal to acknowledge possession of identity is invariably partial and inevitably problematic," Younge writes. "Those who, at certain moments, claim they had nothing to do with slavery, denying women the vote or invading other nations will at others be proud to attach themselves to events at which they were not present and hail achievements to which they contributed nothing." In the Guardian, Sarfraz Manzoor, a Briton of Pakistani background, wrote this when "Who We Are" was published last year in Britain: "There are fascinating tales, such as the black girl born to white South African parents and the son of a Jewish leader who was judged not to be Jewish. Younge correctly notes that identity is dependent not only on the individual but also the behaviour of the wider world. This helps explain why Barack Obama, the mixed-race son of the white mother who raised him, defines himself as black, and it is also a factor in the emergence of political Islamism across Europe." Deborah Adams, on the website Curled Up With A Good Book, wrote, " 'Who Are We' is the best introduction to cultural understanding and competency that I've ever read. Gary Younge covers a broad range of examples, enough to tag every reader with at least one instance of self-identity that has been overlooked. This is the book that should be required reading as early as middle school because it has the potential to show us not only how we appear to others, but to bring us closer to a clear understanding of ourselves."